Hooray! Today is my birthday, and I want to share a slice of cake with every one of my friends. 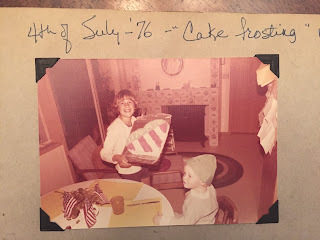 This cake below, from 1976, should be large enough for everyone to have a slice! A trip down memory lane! I can still remember the feeling of growing tall enough to look at the oven knobs straight on, instead of having to stand on tip toe. For a birthday treat, I'd like to share a favorite book: A Piece of Cake, by LeUyen Pham. It will bring lots of smiles, as kids laugh at the unexpected twists at each page turn. Kind little Mouse has made a birthday cake for his friend Little Bird. He sets off to deliver the cake, but meets other friends who ask for a piece. Pham sets up readers to expect that Mouse will gather the expected ingredients along the way: eggs, milk, honey. But with each page turn, Mouse's friends offer something completely unexpected in return. 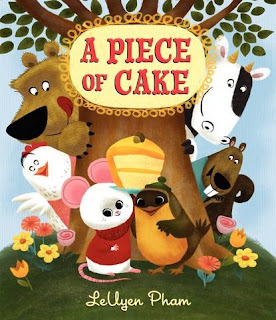 Piece by piece, Mouse trades away the cake until he has none left, arriving at Little Bird’s house only with an odd assortment of things... As they walk back to Mouse’s house to make another cake, they find each friend surrounded by trouble. Once again, Pham expertly manages page turns to surprise readers with the solutions that Little Bird cleverly suggests. Many of my students turn to books to sink into someone's world, to understand someone else's struggles and gain perspectives on their own lives. Fish in a Tree has been a favorite at Emerson all spring precisely because of this. Lynda Mullaly Hunt draws readers into Ally's world and helps them understand how hard school is for her. My students keep recommending this to one another, especially to friends who like stories that really reach your heart. Ally Nickerson knows how to survive a day at school, but each day is an ordeal. In 6th grade and at her seventh school, Ally does everything she can to cover up the fact that reading and writing are nearly impossible for her. "I wonder what it would be like to be able to relax at school and not have to worry every second of every minute." Her teachers and her principal say that it's up to her, but Ally knows that it isn't. She just feels broken -- except when she's drawing in her Sketchbook of Impossible Things. When Ally's teacher goes out on maternity leave, a new young teacher takes her place. For the first time, a teacher really sees Ally for who she is, for what her real strengths are as well as her profound struggles. He helps diagnose her dyslexia and starts giving her extra reading support after school. At the same time, Ally starts developing friendships with two other kids who also don't fit the typical mold. These friendships and her new reading skills help Ally believe in herself and her own gifts. 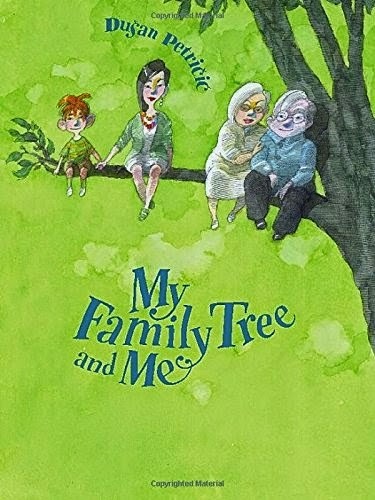 "Filled with a delightful range of quirky characters and told with tons of heart, the story also explores themes of family, friendship, and courage in its many forms. 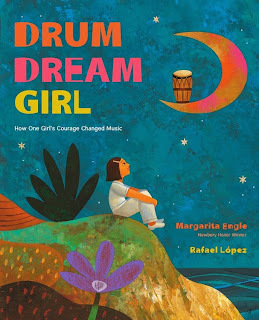 And while a girl with dyslexia may be the center of the book, it has something to offer for a wide-ranging audience, making this an excellent class read-aloud. A hopeful and meaningful choice for those who struggle academically, this is as unique as its heroine." Share this book trailer with kids to give them a feel for the story, and then head over to the Mr. Schu's blog Watch.Connect.Read for Lynda's wonderful essay about how she approaches her writing, starting with character and what she sees in her head. 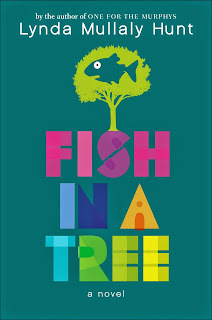 When the literacy coaches at Berkeley Unified School District asked me to recommend a book that lends itself to talking about multiple perspectives, I recommended Fish in a Tree. They loved how you could pause to think about the story from the principal's point of view, Ally's mother's, or her brother Travis's perspective. Teachers will want to check out this educator's guide for more ideas. The review copy was kindly sent by the publisher, Nancy Paulsen/Penguin Random House. If you make a purchase using the Amazon links on this site, a small portion goes to Great Kid Books. Thank you for your support. Emerson's fantastic book club met today for our Summer Reading Celebration and 45 kids came to the library to have lunch together, swap book recommendations and share their love for reading. We had such a fun time! It was so much fun hearing kids share about why they'd recommend a book to friends. The books that are getting the most love right now are definitely The Detective's Assistant, Echo, Fish in a Tree, and Gone Crazy in Alabama. 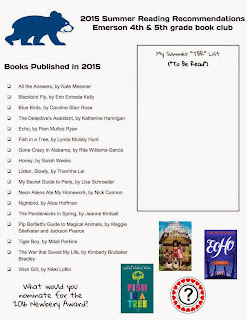 After sharing book recommendations, we took some time to write our own "to be read" lists. 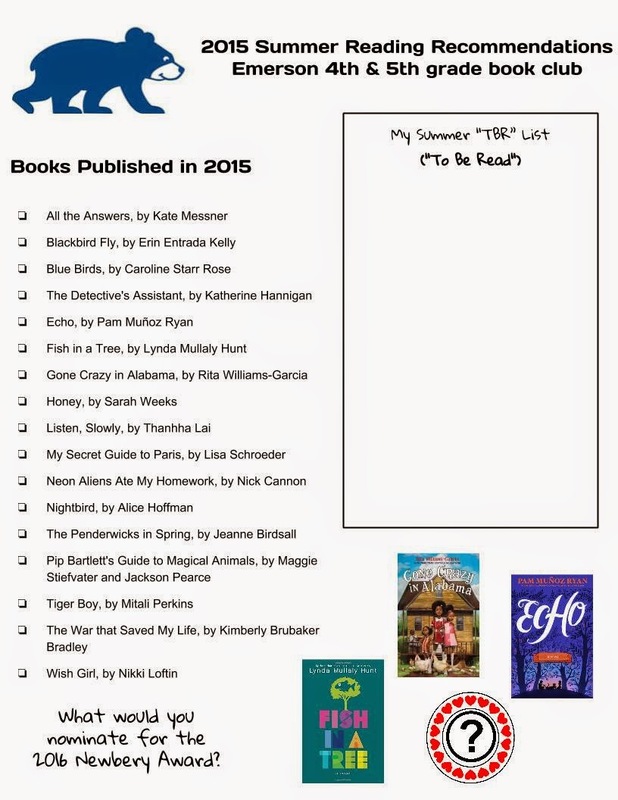 These lists help us look forward to the next book we want to read. It's a habit I want to instill in all my students. And so it was great to take a minute to write down our ideas and ask friends for recommendations. We finished our celebration by taking "shelfies" -- pictures with our favorite books and with the books we want to read. It was a terrific celebration of our love of reading. Many thanks to Melissa Guerrette for her inspiring article on the Nerdy Book Club blog all about shelfies. I'm sure our sheflie celebration with get many many of our students talking about books they want to read. Many thanks to all of the publishers who support our book club by sending us advanced copies. If you make a purchase using the Amazon links on this site, a small portion goes to Great Kid Books. Thank you for your support. "I want to be a cat." "You can't be a cat." 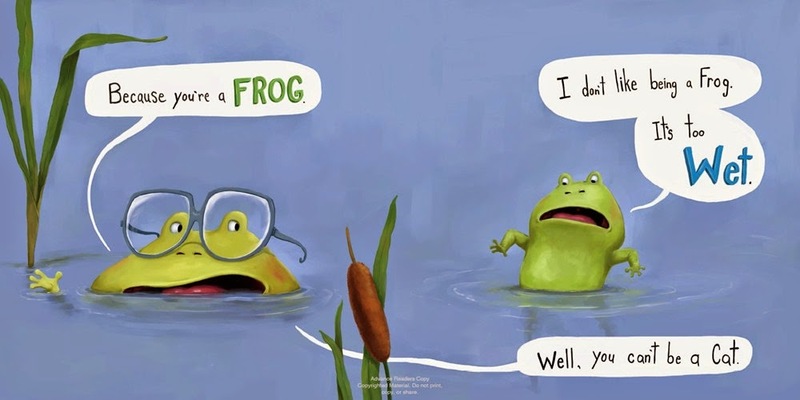 "I don't like being a frog. It's too wet." "Well, you can't be a cat." Along comes a hungry wolf who tells how much he likes to eat all those animals. But does he like to eat frogs? No, not one bit. They're much too wet, too slimy, too full of bugs. 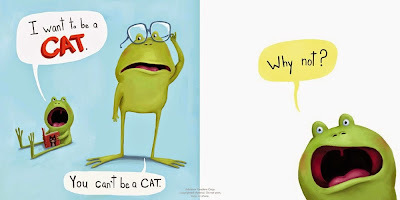 Ahh, little frog finally realizes that--you know what, being who you are can be a pretty good thing after all. Illustrations ©2015 by Mike Boldt; used with permission from the publisher. The review copy was kindly sent by the publisher, Random House. If you make a purchase using the Amazon links on this site, a small portion goes to Great Kid Books. Thank you for your support. As parents, we want our children to enjoy reading, so that they want to read more. The single most important thing you can do to help ensure this? Read aloud. Find stories that you can share together. Find books that linger with you, that make you both wonder about the world. Tiger Boy, by Mitali Perkins, is perfect for a family read-aloud--the 4th graders at Malcolm X School in Berkeley are giving it huge thumbs up and I heartily agree. 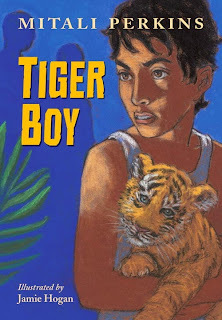 If you have an animal-lover, or you're looking for a book set in India or Bangladesh, or you're looking for a book with a courageous kid who stands up for what's right -- definitely seek out Tiger Boy. When a tiger cub escapes from a reserve in the Sundarbans, a delta region straddling the India-Bengladesh border, many of the residents on a nearby island try to find it. Some are worried that its mother will set out looking for it, possibly hurting or killing people in the process. Others have been hired by a wealthy man to capture it for trade on the black market. Neel is determined to help with the search--protecting the tiger cub is as important to him and he isn't afraid to stand up to greedy Gupta or his hired men. Neel's parents want him to focus on his studies and prepare for his exams. While Neel loves learning and languages, he finds math frustrating and confusing. And how can he concentrate knowing that the tiger cub needs his help? 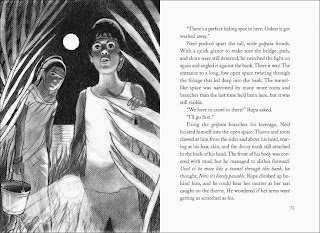 "The sense of urgency that propels Neel and Rupa’s hunt for the cub creates the perfect amount of tension in an engaging story wonderfully grounded in Neel’s point of view and his experiences in his family and community. Their effort to save the cub helps Neel understand how furthering his education is one means of helping protect the place he lives." I especially love how Perkins balances the relationship between Neel and his sister Rupta. Perkins both respects the traditional role that women have in this Bengali village, but she also shows Rupta playing an active role. I have found that my students are not picking this up on their own, even when I recommend it. That's why I think it would make a terrific read-aloud. Parents (or teachers) can encourage kids to give something a try that might be different from the usual books they read. It would make a great book to read this summer or in the fall--see if it leads kids to wanting to learn more about protecting the tigers in the Sunderbans. Illustrations ©2015 by Jamie Hogan; used with permission from the publisher. The review copy was kindly sent by the publisher, Charlesbridge. If you make a purchase using the Amazon links on this site, a small portion goes to Great Kid Books. Thank you for your support. As kids enter school, their peer groups start having a strong influence over them--with that comes pressure to fit in. So that's why I love books that give the message that we want lots of different types of friends, that we all need the courage to be ourselves. 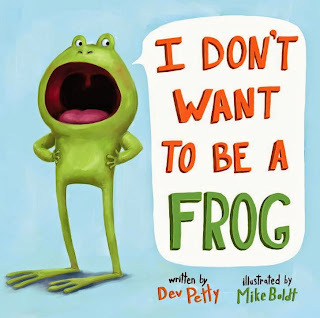 Here are three new favorite picture books that sing that song. Warty Warthog has warts, Rhino has wrinkly skin, and Crocodile sports a toothy grin--but they all love who they are. 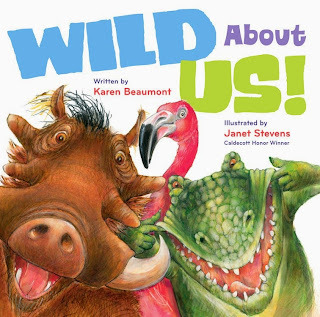 With snappy rhythm and rhymes that are a joy to read aloud, Beaumont celebrates what makes each animal unique. 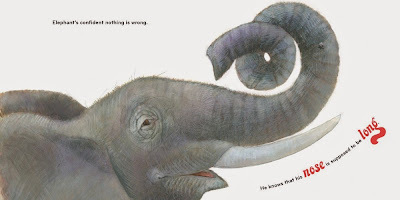 "Elephant is confident that nothing is wrong. He knows that his nose is supposed to be long." 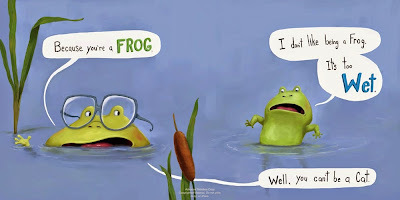 Janet Stevens is one of my favorite illustrators of animals--I adore her Help Me, Mr. Mutt! Here, her animals are full of personality and pizzazz. Kids will love the cartoony appeal, but also connect to how each proudly declares how they love themselves just the way they are. 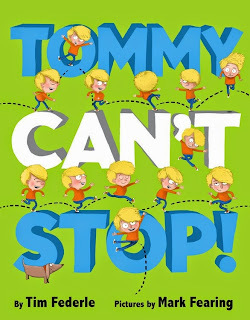 Young Tommy is in perpetual motion, bouncing like a pogo-stick, hollering while he hurdles and clomping like an elephant. He's driving his family crazy ("'He's an animal,' his sister pouts to their parents.") but you can tell from the illustrations that this is a little guy who's just got to move. When his mom drags him to tap class, he's really not sure it's for him. But when the teacher begins bouncing, he's hooked! 'You're a ... pogo stick!' he whispers as he watches. 'I call this a hop'"
I love the way this book shows Tommy discovering a joyful, positive way to channel his energy. When the tap teacher kicks, he's amazed that she kicks like a bulldozer -- but she says, "I call this a brush! (Everyone brushes, but Tommy brushes boldest.)" 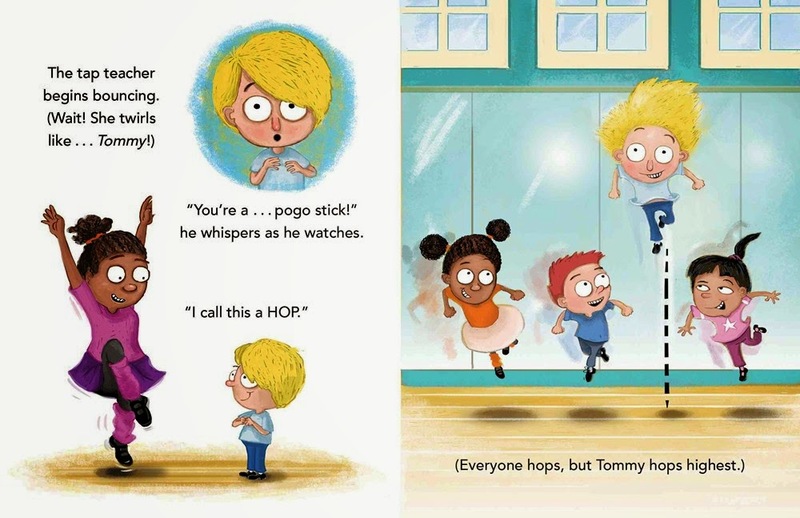 Kids--quiet ones and rambunctious ones--will feel this joy coming through both the illustrations and the words, as Tommy discovers how being true to himself helps him be a star. Cuba is an island full of wonderful music, but this beautiful picture book shows how hard one girl had to work to be true to her musical self. Millo Castro Zaldarriaga, who was of Chinese, African, and Cuban descent, dreamed of "pounding tall conga drums / tapping small bongó drums, and boom boom booming / with long loud sticks." But in 1930s Cuba, drumming was taboo for girls. Millo was not deterred, playing her drums every chance she can, even if it was in her own head. Finally, her father softened and brought a teacher to listen to Millo's drumming--a teacher who was so impressed that he allowed her father to have courage to break the social taboo. I just love how Millo's joy comes through in the illustrations. 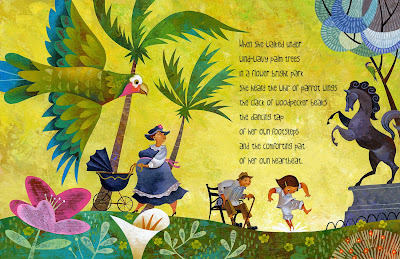 López captures a visual rhythm, the way that Engle does in her poetic text. This beautiful, poetic picture book will inspire children today to follow their own dreams, even if society around them scorns them. 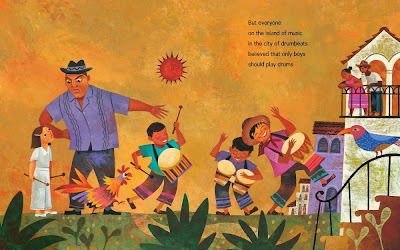 To see more of these wonderful illustrations, head over to Seven Impossible Things; to learn more about Engle and Lopez's creative process, definitely read Julie Danielson's article in Kirkus: Beating the Drum for Women's Rights. I hope you enjoy these new picture books. Whether it's humorous animals, bouncing little boys or girls who feel music thrumming in their souls, these stories can speak to kids, helping them have the courage to be themselves. 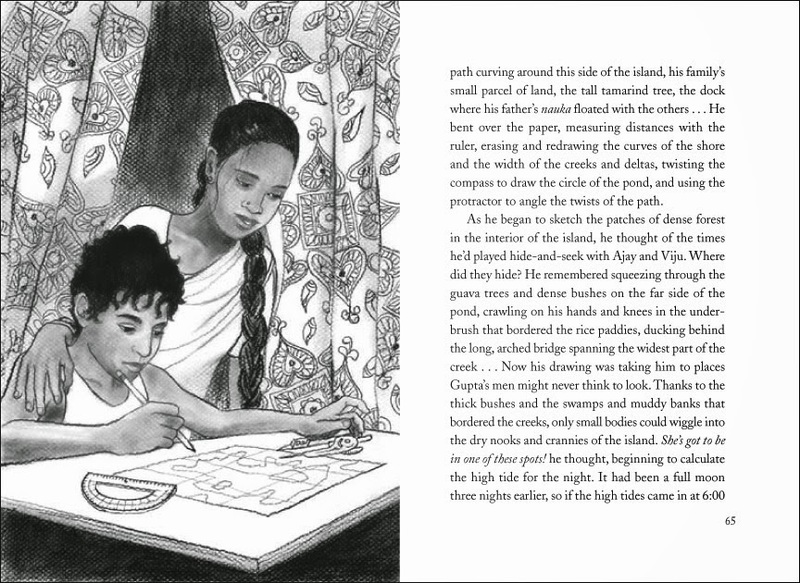 Illustrations ©2015 by Janet Stevens, Mark Fearing and Rafael López; used with permission from the publishers. The review copies were kindly sent by the publishers, Houghton Mifflin Harcourt and Disney Hyperion. If you make a purchase using the Amazon links on this site, a small portion goes to Great Kid Books. Thank you for your support. 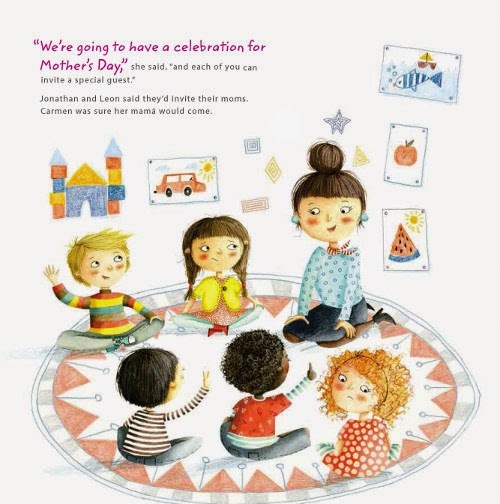 Three new picture books celebrate all types of families with joy and love. Share these with preschoolers or kindergartners, especially as Mother's Day approaches--helping kids recognize that families take many shapes and forms. This book is sure to bring giggles as you read it with young children. 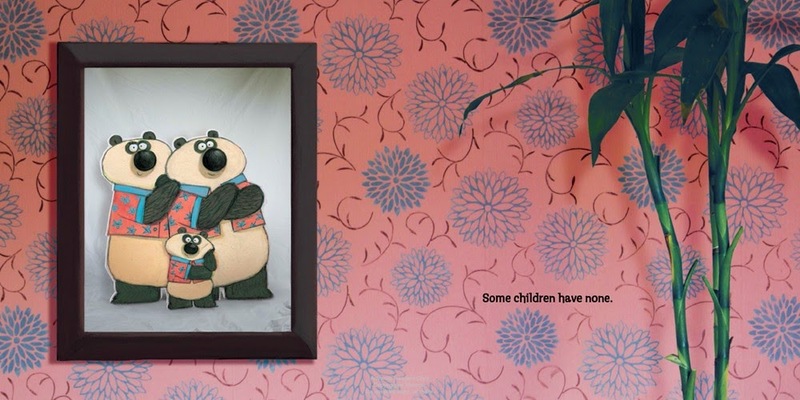 Lang shares a medley of silly cartoon animal families showing all kinds of nontraditional families. Each cartoon portrait is framed, hanging on a wall -- the realistic elements adding to the humor. 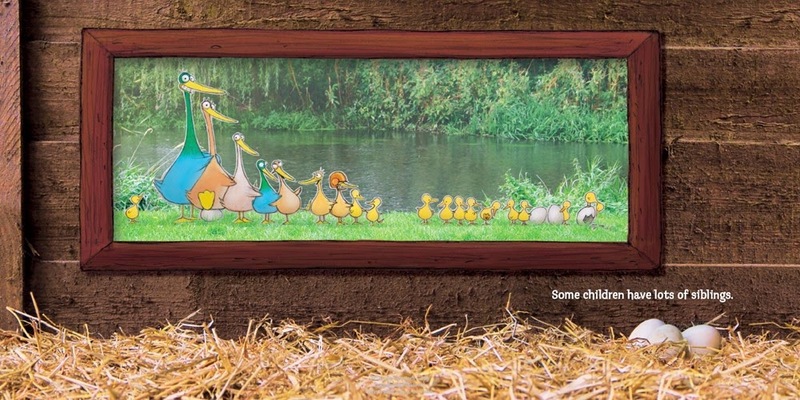 "Some children have lots of siblings"
Gently rhyming lines accompany the family portraits: "Some children live with their grandparents/ and some live with an aunt./ Some children have many pets/ and some just have a plant." 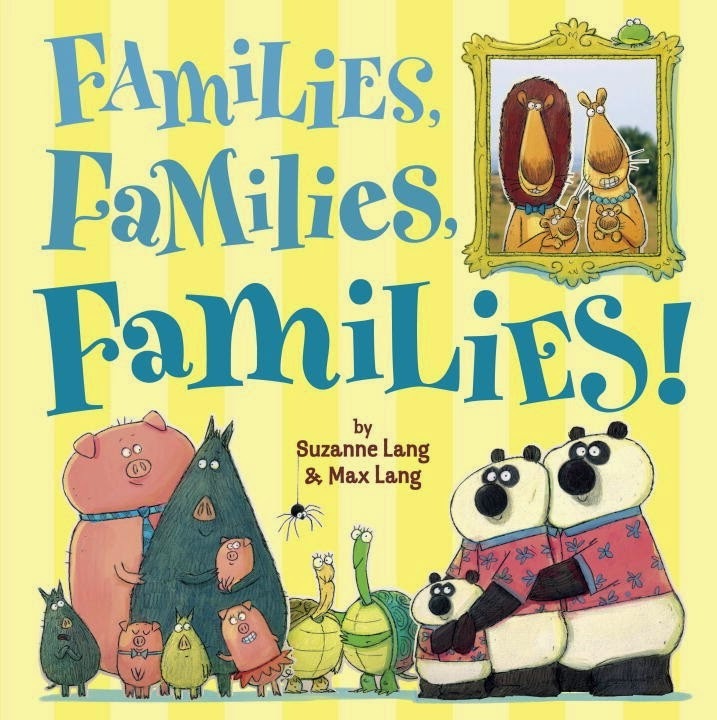 As the SLJ review clearly states, "The loud-and-clear message is that 'if you love each other, then you are a family.' And imagine the many children who will be reassured because they have found a portrait of a family they will recognize as their own." A delightful celebration of diversity, treated with loving humor. 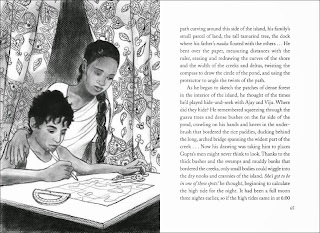 Beginning with his great-great-grandparents on his father’s side, a young boy introduces his family, leading to a current family portrait at the book's center. 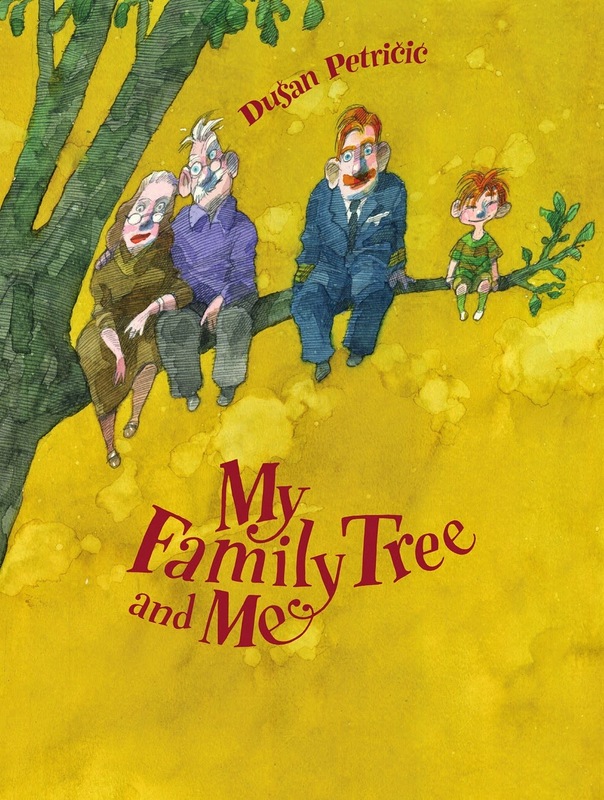 This provides a wonderful way to help children really understand and visualize what a family tree means. The second-half traces his mother’s family, back to his great-great-grandparents on her side. A delightful celebration of multicultural, multigenerational family. I especially love how easily Petričić integrates diversity into this picture book. The young boy's family is biracial, and each side of his family tree celebrates different heritage. Careful readers will notice how family traits carry on from one generation to the next. Best of all, I think this will help children start wondering about their own extended families. When Stella’s teacher announces their class is going to have a celebration for Mother’s day, everyone is excited, everyone except for Stella. What should she do? She has two dads and no mom. "We're going to have a celebration for Mother's Day"
"Stella would be the only one without a mother at the Mother's Day party." 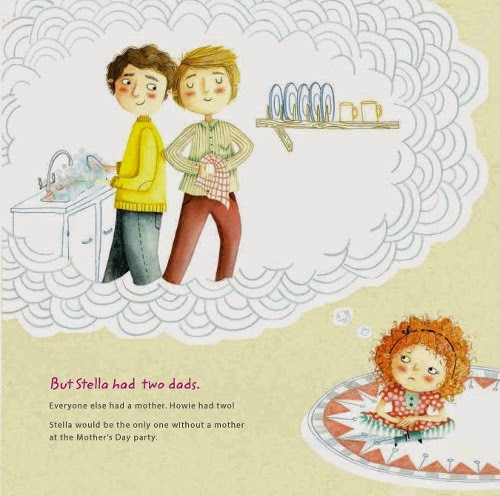 Schiffer tells the story through Stella’s eyes, perfectly capturing a child’s perspective -- sharing her worries, her classmates’ questions and the solution that Stella and her family come up with. This helps kids connect to Stella, empathizing with how she feels. 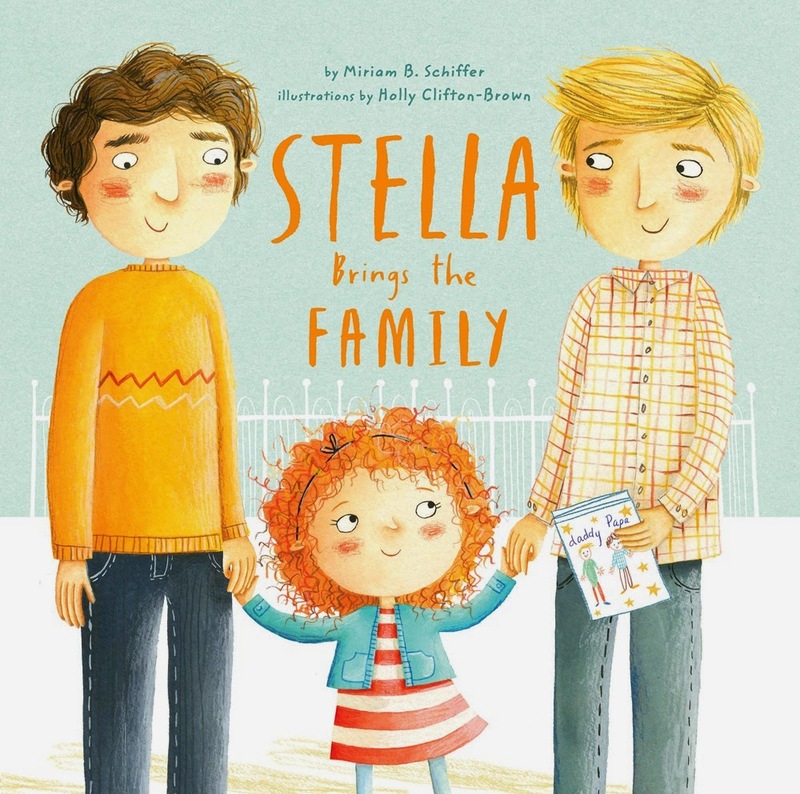 When the big day arrives, Stella brings her whole extended family and feels surrounded by love and happiness. I hope you enjoy seeking out these books as you celebrate all kinds of families with children. Picture books are both mirrors of our own worlds, helping us see ourselves a little more clearly, and windows into other people's worlds. 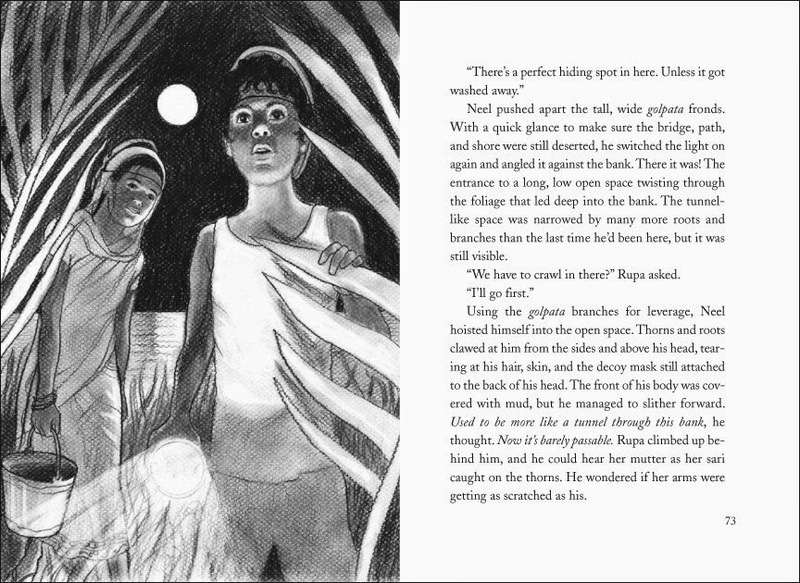 Illustrations ©2015 by Max Lang and Holly Clifton-Brown; used with permission from the publishers. The review copies were kindly sent by the publishers, Random House, Kids Can Press and Chronicle Books. If you make a purchase using the Amazon links on this site, a small portion goes to Great Kid Books. Thank you for your support.